Just the right combination of storage and surface space are offered in our Amish Lucern Mission Desk with Topper. 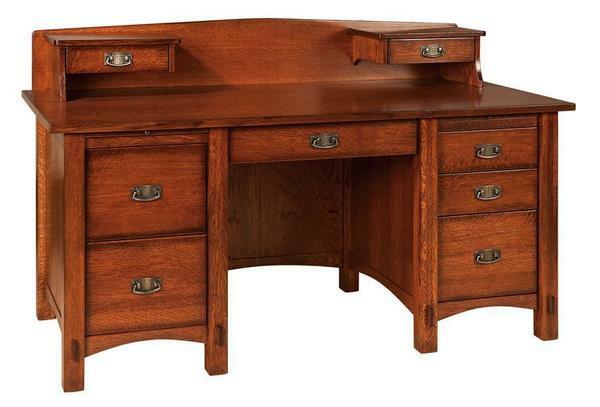 This lovely solid wood desk is simple and natural and ready to get down to business. A 64" width provides room to work on projects of all kinds. Adding the topper brings additional charm with a display of solid wood offering two tidy drawers for small office items. Set up the Lucern in your home office, bedroom or hallway and enjoy the beauty it brings. This is heirloom quality office furniture that will not have to be replaced after a few years of use. Versatile and completely customizable, the Lucern Mission Desk is yours to design. Shown here in quarter sawn white oak wood with Michael's cherry stain. Quarter sawn white oak wood offers a unique texture as the cutting of the log creates a lovely flaking pattern throughout the wood. Choose the solid wood option and stain you like best, with samples to work with while you decide. Be sure to view our Amish Lucern Mission Printer Stand and the Amish Lucern Mission Bookcase that share the beautiful mission style of this desk. Email or call us today with any questions or for assistance with your order. We can be reached toll-free at 866-272-6773.